A new handicraft club for the over 50s. Try your hand at detailed crafts and learn new skills, with sessions including a mix of pottery, textile craft, crocheting, jewellery making and much more. Refreshments available, including the odd homemade cake! Do you need legal advice about a family matter? The Caxton House Family Legal Advice Clinic is open to everyone, and provides FREE, face-to-face advice and support. 15 minute appointment available with qualified Family Law Solicitors, who can assist with family matters. Anand Mandal has been running for 29 years, itâs primarily for elderly people living in the borough of Islington. It involves social events (such as lunches, cards, games, chair based exercise and trips) as well as offering advice and information on health and welfare issues. Computer basics: Such as MS Office 2007 (Word, PowerPoint, Excel), Internet and Email, Accessing benefit information and applying for benefits online, Jobs and training search, Using and purchasing through an Islington Council e-Account e.g. : parking vouchers, resident permits, paying rent and council tax. All ages welcome. Come and share your talents by joining our new community choir and drama group. At Caxton House Drop-In we provide opportunities for children under the age of 5 to grow, play and make a positive contribution. The Drop-In is a special place for children to develop vital skills. Come along to join in with activities such as messy play, circle and story time, healthy snack table and herb garden, and much more! Ages 8 -13 yrs. Do your homework, make smoothies, access a computer and socialise! Have fun while learning with the new Homework & Health Club run in partnership with the Hills Community Trust. Come along and enjoy cooking sessions, growing your own food, and crafting and learning! Pilates focuses on building your bodyâs core strength and improving your posture through a series of low impact stretching and conditioning exercises. Go-Kan-Ryu Karate offers a way for you to learn self defense, increase fitness and relieve stress whilst building confidence. Improving self-esteem and increasing focus and concentration. Classes are available at Caxton House on Wednesday for adults, children (5+) and families. The Wing Chun School specializes in teaching children of mixed ages and abilities. Taught in an encouraging and positive atmosphere, Wing Chun aims to enable children to actively increase confidence, discipline, fitness and essential self-defence skills, whilst benefiting the child as a whole, both mentally and physically. Improve flexibility while strengthening and relaxing your body! All abilities welcome, whether youâve done yoga before or are a complete beginner. First session is FREE, Â£5 per session after. No need to book, just drop in. We have basic mats but encourage you to bring your own if you have one. There has never been a better time to join a Weight Watchers meeting and lose weight. You're closer than ever to looking and feeling great. The Weight Watchers programme is uniquely positioned to allow you to play the weight loss game and win. Based on up-to-date science and tried and tested over the years by real people, the Weight Watchers programme comes from the experts at the weight loss game. Itâs designed for living and losing (weight, that is!). A free service aimed at the over 55âs but open to all, gentle exercise will provide both health benefits and that extra boost of confidence! Improving flexibility, coordination, balance and suppleness, strengthen muscles and bone density, improve your confidence and feel good! Can help with back pain, stress and anxiety. Experience Archery London is a fully mobile company with a passion for making this historic and fun sport accessible to all. Whether you're 8 or 80, Experience Archery can tailor an event or programme to suit your needs. Offering archery parties, archery lessons, archery courses, have-a-go events, individual or group archery tuition, archery in schools and youth centres, and stag/hen archery days. Get fit, have fun and meet new people at Family Dance Class! Aimed at all abilities, itâs open to all and can be done sitting down if you prefer. Classes are Â£2 per session, first session if FREE to newcomers and children go free but must be supervised by an adult. Join the party at our new Zumba Dance class! Get fit and have fun, while learning new routines and listening to some great music. 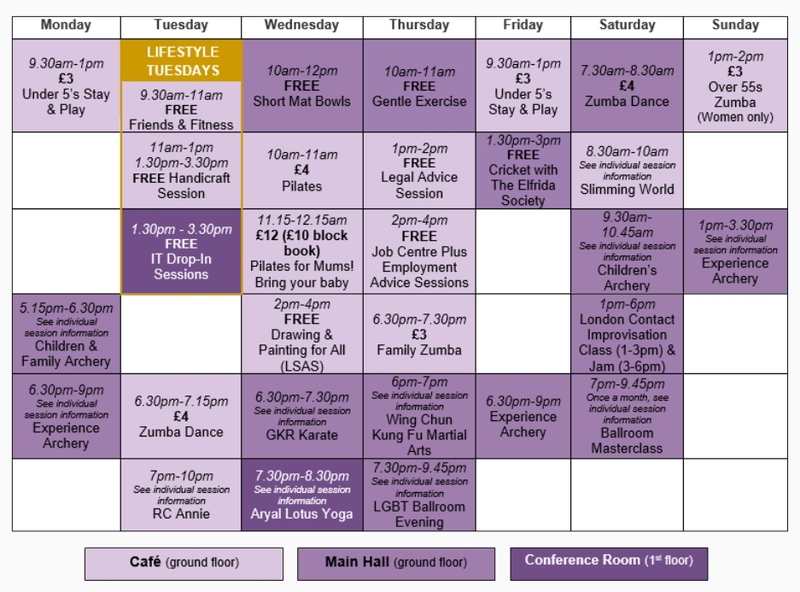 Our weekly activities timetable shows you what's going on at the centre throughout the week. Download our What's On Leaflet, for a list of regular weekly activities and groups that are based at the centre. Please note that these are the regular weekly sessions, and that this timetable does not include any one off sessions or events.